On Sunday, Donalyn Miller wrote a post entitled Touchstones, that talked about reading experiences and books that have been meaningful to people at different points in their lives. I think everyone who read that post has been thinking about their touchstone books. I certainly have and inspired by Donalyn and by another slicer named Beverly, here are a few of mine. 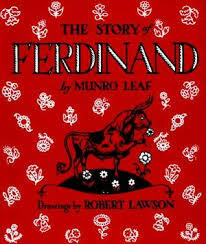 First and foremost, comes The Story of Ferdinand by Munro Leaf. Originally published in 1936, this was the first book I read where I made an intimate connection to a charter. I was a quirky little kid, big-eyed and diffident. Like Ferdinand, I often felt out of step with everyone around me. But here was a book that showed me that I was not alone in my solitude. I can still get weepy talking about Ferdinand, almost 50 years after I first picked it up. In grade two or three, our library-less school got a school library. the first book I checked out was Charles Dickens’ A Tale Of Two Cities. I’d heard of it and knew it was a classic, so what the heck. I got called the classroom door the next day and interrogated about checking out the book. I felt like I had done something bad and was embarrassed about using the school library after that. As an adult, I vowed to never make a child feel that way about any book. My most important touchstone during elementary & middle school was not a book, but a librarian. Lynn Leu was the children’s librarian at my local library. She was the first person who really talked to me about books. One of the touchstone books of my teen years was Mrs. Mike by Benedict and Nancy Freedman. I read this multiple times while I was a teen and never tired of the story. It appealed to my sense of wanderlust and showed me a young woman who defied convention and did not shy away from working to attain what she wanted. More recently The One and Only Ivan has become a touchstone. Aside from the fact that it is a beautiful book, it came just as I lost the library job I loved so much. I connected with Ivan in a way I never expected and I actually burst into tears when it was announced that Ivan had won the Newbery Award. I just love your open, vulnerable connections to each of these books. And hooray for you for learning how to treat a child with his or her choice of books. 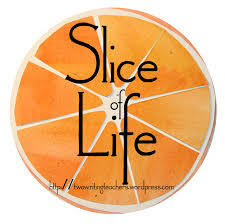 Thank you for a great slice this morning! I loved Mrs. Mike, too. The One and Only Ivan was well-loved as a read aloud this year, along with the picture book. I’ve read all of those and agree with you. Certain books just become a part of you. Loved Wonder for that reason as well. Kindness matters. I don’t know Mrs. Mike, I will have to look for that one. It is interesting that books can resonate with you for all your life. 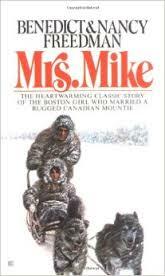 I loved Mrs. Mike, too and had not thought about that book in quite some time. Thanks for the reminder! I think I need to revisit it. Some books do touch us in ways that others don’t. I love your list of books. Ivan is one of my favorites. I love the thought of touchstone books. Thank you for this post. I am now thinking about mine! Such a great thing to think about. I think Go Dog Go is the first book I remember. I made my mom read it so many times we could say the words together without the book. The first book I read twice was about a seeing eye dog. Over the years I have tried to remember the title but I only remember the story. The first book I read for fun was The Promise by Danielle Steele. I never considered myself a reader before then. All bring back special memories of reading. Now I’m off to read Donalyn Miller’s Touchstone books. Thanks!